Baby Bats in August - What and When Is The Bat Maternity Season? What Is The Bat Maternity Season? If you have bats in your home or building, they are female bats. Only female bats form colonies, and they enter a home or building so that they will have a place to have their babies. Each female bat has only one baby, or pup, at a time. The pups are unable to fly for several months; the mothers can carry the pups when they fly, but the babies soon grow too large and heavy to be carried. Most of the time, the pups are left in the roost while the mothers go out and get food. The exact dates of bat maternity seasons in the U.S. vary according to the climate. Warmer states have an earlier maternity season, and cooler states have a slightly later maternity season. The dates vary between mid-April to early June for the beginning of the maternity season and mid to late August for the end of the maternity season. Read the whole Bat calendar here. By the end of the bat maternity season, all of the pups born in the spring will be able to fly, and they will no longer be left in the roost at night while the mothers feed. Removing bats from a home or building involves installing exclusion devices at the bat entry points. These are one-way devices, so the bats can exit, but they cannot return through the device. Only the adult bats fly out at night; therefore, the removal works only on the adult bats. If there are flightless baby bats in the roost, they are stuck in there without their mothers to feed them. There are multiple reasons why you should never remove bats during the maternity season. The first reason is that it is illegal. Bats are a protected species due to the benefits they provide by eating insects and pests. Occasionally, there are special circumstances where an order is provided by the state allowing for the removal of the bats during the maternity season, but these orders are not given in ordinary situations. If you remove bats during the maternity season without a special permit, then you can be prosecuted and heavily fined. 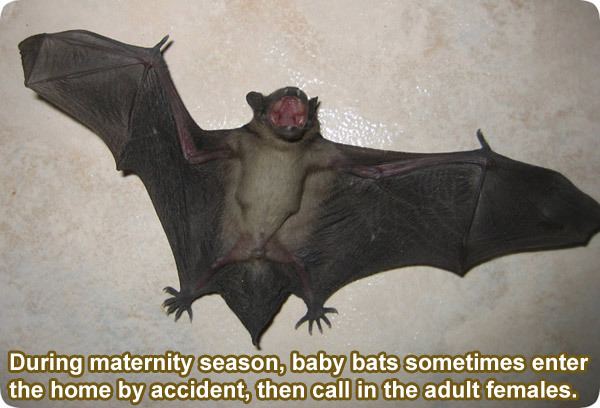 Another reason why you should not remove bats during the maternity season is that it is inhumane. The babies are unable to get food during the maternity season because they cannot fly. If you remove the mothers and block their access to the roost, then the babies are going to starve to death. This is not only cruel and inhumane, but it can also cause bigger problems for you. Some of the mother bats may be relentless in their search for another way into your home or building to get to their babies. They could get in through gaps or cracks that might have been missed when setting up the exclusion devices. They might also try getting in through open doors and windows, and gain entry to the living or working areas of the home or building. The trauma of having a colony of mother bats rush through your open door desperately searching for their babies is not something you want to experience. As the babies will be starving, they are likely to crawl down walls and into the living areas of the building. They are very small, and they can easily get through cracks and gaps. As they are searching for food, they could end up spread out all through your home or building. Additionally, many are likely to die within the walls as they try to find food. Most bat colonies contain a minimum of perhaps 40 female bats, which means 40 babies, as each mother will have one pup per season. That means you could end up with the stench of 40 or more dying animals in your house. Not only will the smell be horrific, but it also increases the risk of infestations as other organisms feed on the decaying bodies. To eliminate all of the potential problems, and avoid prosecution and fines, you will need to wait until the end of the maternity season to remove the bats. While you are waiting for the end of the maternity season, mid to late August, you can prepare for the removal. You should observe the roof of your home or building in the evening to see where the mother bats are exiting. You can examine the eaves, ridge caps, fascia boards, and any other area of your roof that may be the entry point. Bats only need a gap of 3/8 of an inch to squeeze through, so you will need to be thorough in your search. Exclusion devices will be installed to allow the bats to exit and to prevent their re-entry, and after a few days, you can seal up all of the entry points.